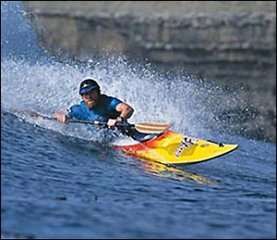 What is the West Coast Surf Kayaking Association (WCSKA)? The WCSKA is a NEW organization whose purpose is to promote and grow the sport of surf kayaking along the US West Coast through educational clinics and event development, support and promotion. The WCSKA is the representing body of the ACA and the western U.S. to the surf kayak world. It is our charter to promote and organize surf contests as a vehicle to educate paddle powered surfers to the ethics of the break. In this we will aid in the appropriate growth of this sport. The WCSKA has been developed by the WCSK Committee. Consisting of 7 nominated and elected members, the Committee’s role is to determine selection criteria for a team representing USA West at the World Surf Kayaking Championships, held every two years. Recently the Committee, guided by input from the larger surf kayaking community, has recognized the need for a broader organization to support the growth of the sport. The Committee encourages surf kayakers and other interested persons to get involved as the Association develops. How will the WCSKA promote the sport of surf kayaking? Create and fund a website to host official rules and regulations, event information, results and rankings, forum about new designs and surfing techniques, and other media. **The first clinic was held in Santa Cruz in Feb. 2006 and was a great success! Produce an informational and fun newsletter to distribute among western surf kayakers. Helping Event Coordinators with consistent judging, rules, insurance info, and permits. Holding a team trial event to finalize the US West Team. Hosting additional events for more competition opportunities. Promote the sport of surf kayaking as a whole. Represent the west coast of the Unites States to the world surf kayaking community. What can I look for the WCSKA to do in the next year? Support the expansion of competitive and non-competitive events along the West Coast. Collect and maintain event results and overall rankings of western competitors. Select the most qualified and competitive team to represent the west coast at the 2009 worlds championships. Seek organizing members and volunteer staff. Had an awesome morning at Bolsa today. Low tide and chest-head high waves on the standup guys. Fast and powerful, with some awesome drops, fast walls, and occasionally enough of a should to make a cutback. Good times, and a mellow vibe with the boardies, I got more questions about the boat than normal this morning. Much fun. The 2009 Team will be selected shortly. Details coming soon. Team Bios - Coming Soon!